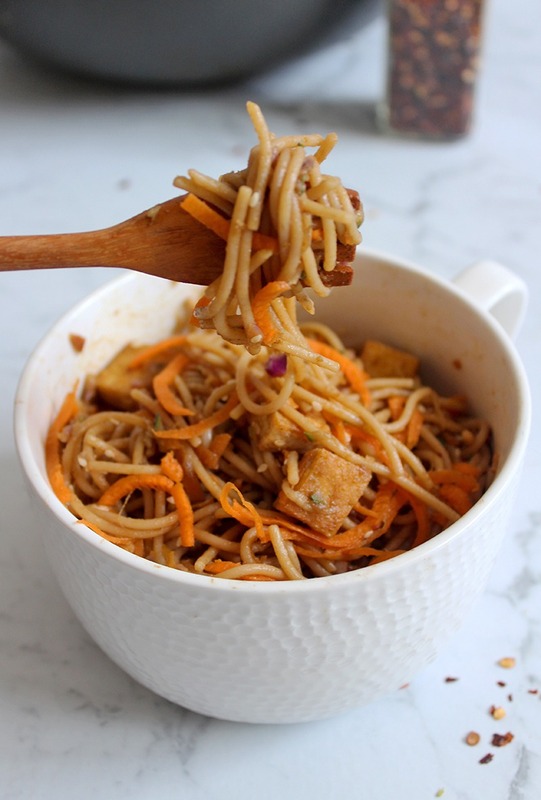 Full of flavour, these Vegan Tofu Thai Noodles are a little spicy, a little sweet and very delicious with crispy fried tofu and grated veggies! 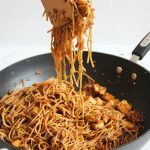 I like to make this recipe when I’m just too hungry or tired to spend a lot of time cooking but I want something healthy, delicious and homemade. I think we all know that feeling! Luckily, this is one of those recipes you make so many times that you no longer need the instructions, it’s super simple and quick to put together. It’s also perfect as cold leftovers for lunch the next day! I really love to grate my veggies for this dish so that everything is stringy and well contrasted with the chunks of crispy tofu. It makes for a fun meal to eat with lots of varying textures. 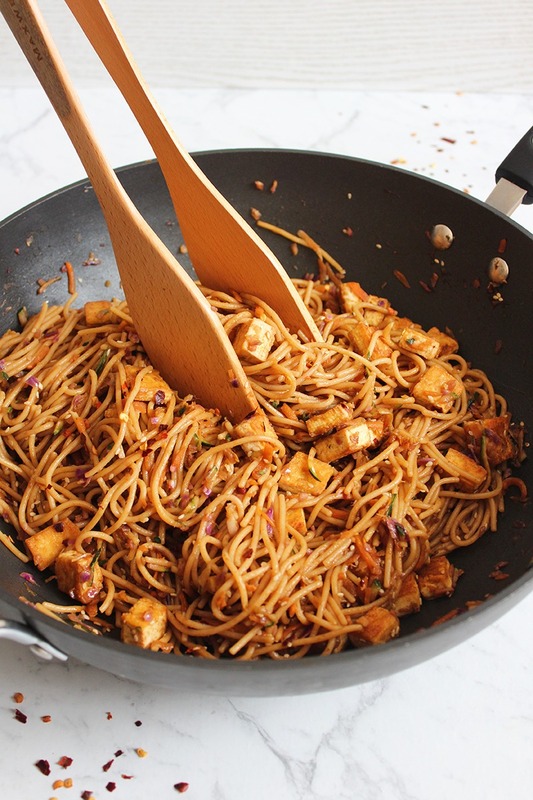 Making these Tofu Thai Noodles only takes about 25 minutes in total and then you have yourself a delicious, warming and slightly spicy dish and leftovers for the next day! 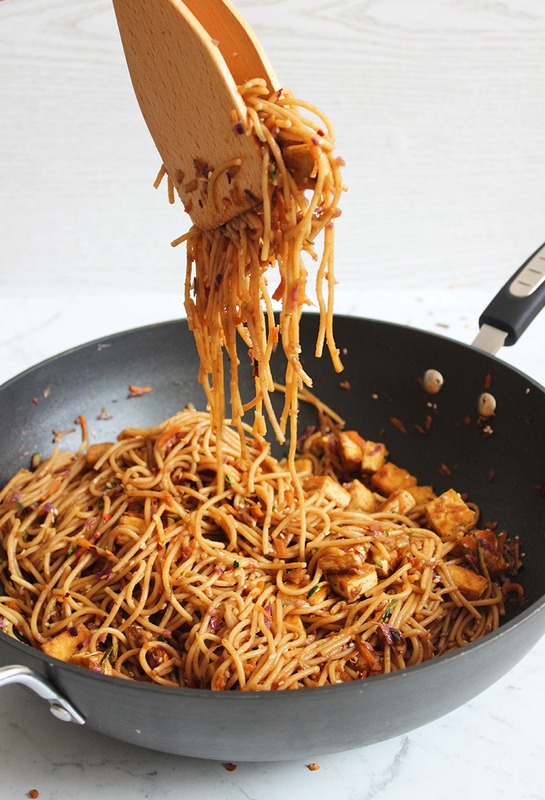 To start, put the pasta on to boil and fry up some minced garlic and chopped tofu in a small amount of oil. Grate some zucchini, carrot and cabbage and add that to the frying pan to become lovely and soft. While that’s happening is a good time to whisk up the yummy sauce. Sesame oil, maple syrup, tamari, brown sugar, chilli flakes, sesame seeds and water. If you’re after a thicker and saltier sauce then feel free to replace the tamari with your fav soy sauce. Now just drain and rinse the cooked pasta and add it to the frying pan with the sauce. Stir so that everything is completely coated. I like to serve this dish with some freshly grated carrot and sesame seeds, however, there are many things that would be great here so get creative! Start the pasta in a pot of boiling water and put a lightly oiled frying pan on medium heat. Finely dice or mince the garlic and chop the tofu into roughly 1.5cm squares and add both to the frying pan. While they’re frying, grate the carrot and zucchini and finely chop the red cabbage. Once the tofu begins to brown slightly, add the veggies to the frying pan and stir occasionally. While the veggies are softening, whisk all sauce ingredients in a small bowl and set aside. When the tofu and veggies are well cooked, add the drained pasta and remove from the heat. Add the sauce and stir until everything is well coated. 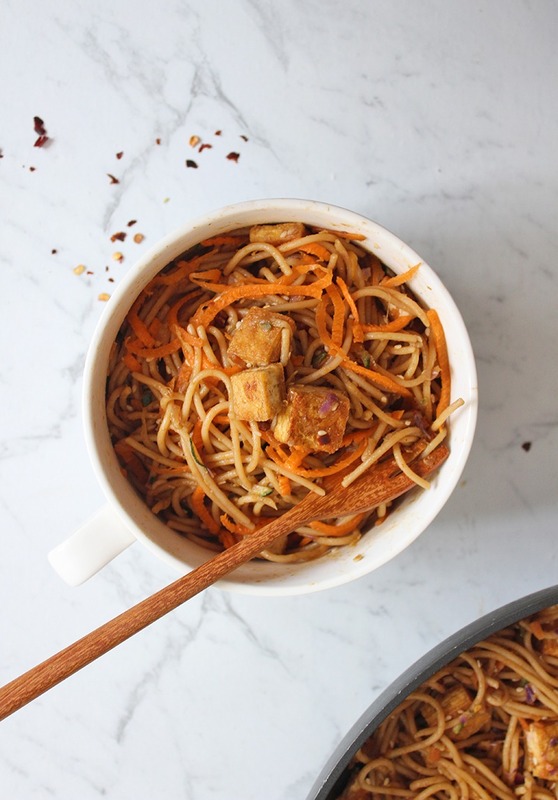 Serve while hot with a sprinkle of freshly grated carrot and sesame seeds. Enjoy!